ACS: Microscopic Picture of a Maggot's Face or Andy Serkis Playing a Microscopic Maggot? Microscopic Picture of a Maggot's Face or Andy Serkis Playing a Microscopic Maggot? Maggots are the most disgusting creatures on the planet, and not very cool, well maybe to emos, steampunks, hipsters, anime fans etc. but I digress. I have felt this way for a long time and still do. I did however find this picture of a maggot when viewed from under a microscope and was taken aback. 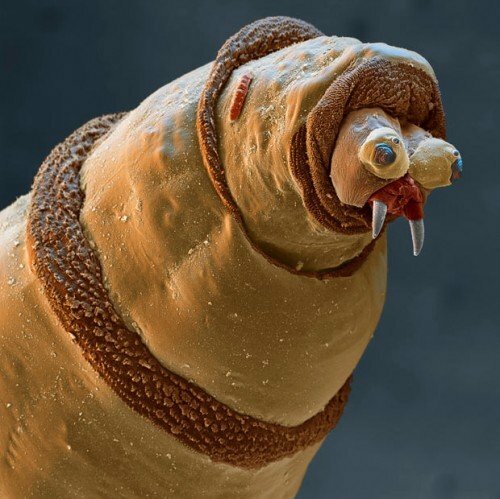 This little fellow appears to have a face, a maggot face, that suggests intelligence, emotions, even self awareness. Perhaps this maggot has dreams, and a family like I do, but because I always viewed him as a pernicious collective rather than as an individual I hated him. Im still not sure how I feel but I think this cool pic needs to be seen.